The SMSC Organics Recycling Facility offers many products to help you create a beautiful, healthy-looking lawn and garden—no matter the time of year. The facility is open to the public Monday-Friday from 7am-5pm and on Saturdays from 8am-4pm. Come visit us anytime to pick up must-have products for your next project! The SMSC Organics Recycling Facility not only creates compost, but we also specialize in a variety of compost blends. Each blend has been carefully formulated for specific applications. Below we’ll highlight some of our best-selling products and the appropriate applications for them. The first product we’ll talk about is compost, which is the base for all of our blends. We create compost on-site with the turned windrow composting method. From start to finish, creating compost at the SMSC Organics Recycling Facility generally takes 4-6 months. The finished product is screened to 1/2” fraction and is a great addition to many gardening projects. Compost is a soil amendment that is added to existing soils and treated like a natural fertilizer. Compost is not a soil itself and needs to be mixed in with existing soil. 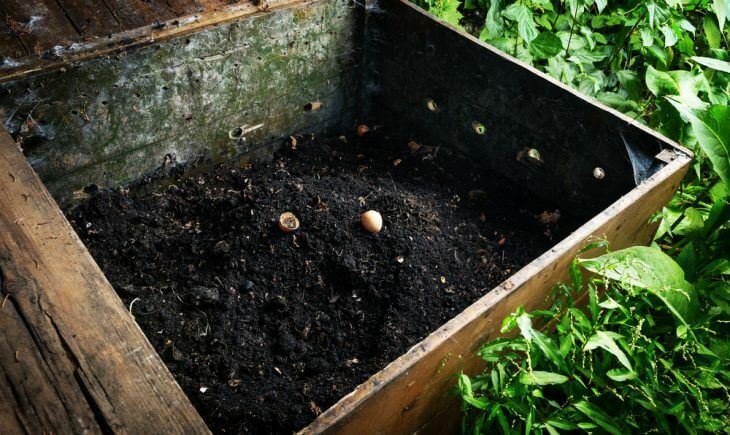 Some good uses for compost would include adding compost to an existing vegetable or flower garden and tilling it in with the existing soil before planting. One of the most popular blends sold at the SMSC Organics Recycling Facility is the Half Moon Blend (also known as 50/50). This blend is a 50/50 blend of compost and screened black dirt. Black dirt is screened on-site to 1/2” to remove rocks, plant debris, sticks, or any other deleterious material. It is then mixed in a 1:1 ratio with compost to create a ready-to-use growing medium. Since this product is pre-mixed, you can start planting right away. This product will help amend low-quality soils by adding nutrients and organic matter back into the soil. Our Half Moon Blend is great for many projects, such as turf establishment or planting shrubs and trees. Another blend sold at the SMSC Organics Recycling Facility is the Harvest Moon Blend (also known as Garden Blend). This blend consists of 40 percent compost, 40 percent screened black dirt, and 20 percent Minnesota peat moss. The addition of peat moss helps lower the pH of this blend, which many vegetables prefer. We recommend using this blend for vegetable gardens, flower gardens, and potted plants. The Rain Garden Blend consists of 70 percent screened sand and 30 percent compost. This blend is formulated to allow infiltration of rainwater. An ongoing trend in urban water management is to infiltrate runoff from parking lots and buildings into the ground rather than discharge water directly into storm sewers and streams. Rain gardens are basins that can be as simple as a low spot in a residential yard to an engineered basin of several acres at a commercial development. Rain gardens are often planted with many ornamental, flowering plants. The plants help filter the water before it makes its way into the groundwater. The compost in this blend aids in plant growth, and the sand allows infiltration. Our Top Dressing is straight compost that is very finely screened to a 1/4” fraction. Most of our customers use this blend to spread over the surface of turf areas, such as athletic fields, often after core aeration. Sprinkling a thin layer of compost over the top of a lawn allows the compost to settle between blades of grass and promotes root growth. Over time, top dressing can increase the water-holding capacity of the soil, so you can water less. Top dressing also helps reduce the need for chemical fertilizers. We can also create custom blends for larger orders (over 100 cubic yards). Contact our main office at 952.233.9191 to find out more! All of our compost and compost blends are sold in bulk by the cubic yard. For reference, you can generally fit about two cubic yards in the bed of a pickup truck. The compost is also sold in 40-pound bags. Visit the SMSC Organics Recycling Facility this fall for all of your gardening and landscaping needs!